All of us are called to multi-task at our jobs. You need a glove that will stand up to the rigors of the grease and grime. 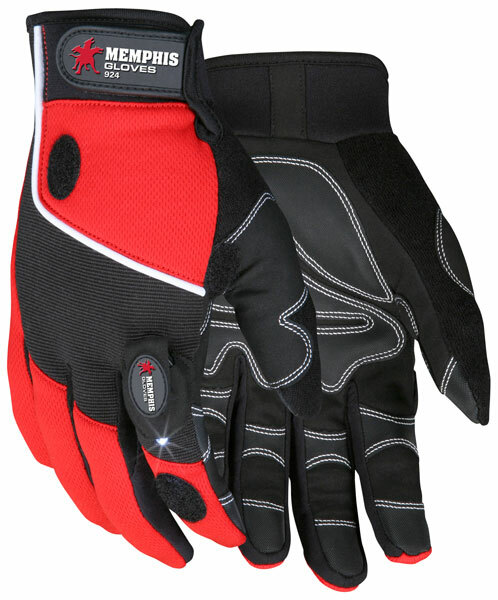 Our Memphis Multi-Task gloves will give you the grip, durability and protection you need for anything your boss can throw at you.The 924 features a black synthetic palm with foam padding and black PVC grip on palm and fingertips. Red/black/white fabric back, black terrycloth thumb, and hook and loop adjustable wrist closure. Two LED lights are included with each pair.